Shirdi Sai Baba Stories,Leelas and Teachings. : Sai Protected Me In False Case -Sai Devotee. Sai Protected Me In False Case -Sai Devotee. Every experience that reaches me through Share your experience from devotees across the globe further strengthens my faith in our Father Sai .Each experience is a message from Sathguru that no matter what the circumstances are never let your faith dwindle.Today's shared experience is a beautiful message in form of the devotees experience from Baba to all His children on Gurupurnima . "I am absolutely in the power of My devotees and stand by their side. For ever I am hungering after their love and readily answer their call in distress” said Baba to Dada Bhatt (Sai Satcharitra Ch.ll). When Dr. Pandit applied sandal paste to Baba's forehead with love . Jai Sai Ram to my all brothers and sisters. Please keep up the excellent seva you are rendering to Sai baba and his devotees. Please do not disclose my name and email. An entirely false case was filed against me and the penalty for which was life imprisonment and a million dollars fine. I was totally innocent but the whole situation spelt catastrophe for me and my family (that includes little children) as we faced total destruction. I was having nervous breakdown and simply did not know what to do. During the major case, it was a very rough time in our life. Horrible false charges were brought against me.I was in total shock. It seemed dark everywhere. Nobody should go through what our family went through. Life was looking worthless at that time. But looking at our little kids we had to live. I was innocent so I was determined to give a fight, no matter how powerful the opposite party was. I took a break and went to India. I stayed with my brother-in-law who is a great devotee of Shirdi Sai Baba. Of course all Indians are aware of Sai but I was not his follower. My brother-in-law who is a devotee of Sai Baba also had a beautiful experience in his life. He was married for 7 years but had no child. They went to the best of best doctors for fertility treatment and religious places. But there was no hope. He was depressed. Then one day he was invited for dinner at his friends place and they introduced him to Sai baba. My brother went to Sai temple and prayed for child, after 15 days we got the news his wife is pregnant. Now he has a beautiful healthy chatterbox girl. Since then my brother-in-law became staunch devotee of Sai baba and goes to Shirdi twice a year now. Coming to our experience now,my brother-in-law took me to the local Sai temple and advised me to pray. He told me that Sai freed his followers from miseries. He took me to the temple several times and also gave me a statue of Sai when I was returning to USA. I and my wife became devotees of Sai. We read the Sai Sat Charitra and Sai Raksha Mantra everyday besides lot of other Sai literature. We read your website regularly and the experiences of other devotees gave us lot of strength and encouragement. Me and my family kept our faith strong on Sai. 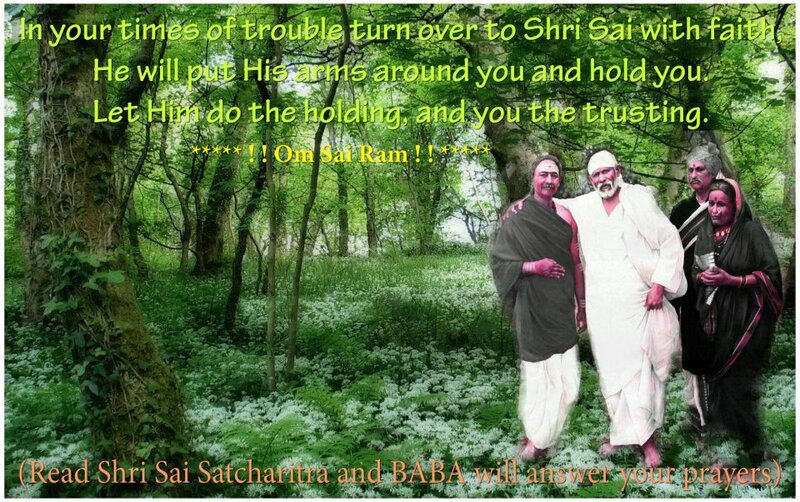 Before the trial, the government created several difficult situations but Sai helped us to overcome them. The trial started. The government used every deceitful means to convict me. Even my own lawyers were pessimistic and prepared me for conviction and arrest. Every day I left, I did not know whether I was with family for the last time in my life. It was very stressful but kept our firm faith in Sai and prayed to him even in the court. I applied the udi from Shirdi (which my brother-in-law sent) daily before going to the court. The jury gave verdict in my favor. The prosecution and other government agents were dumbfounded. Their jaws dropped and expressions fell. They rarely face defeat. I stood up and prayed to our beloved Sai. I am grateful to my brother-in-law for bringing Sai in our lives just before the court case. Sai baba was always there for us. Sai baba knew I was innocent. We believe the whole deal was either past life karma or don't know what do we call it. It was definately a big test for our family. Our faith was never shaken no matter what, we kept praying everyday. Few relatives and friends turned their back on us but couple of good friends and relatives, believed in my innocence and were very supportive. We are very grateful to those families and friends who stood by us during our rough time. May Sai baba bless them. We don't have Sai temple in our city. My brother, who lives in India is a very staunch devotee, he goes to local Sai temple on behalf of us daily. We would like to request to all devotees to please keep us in our prayers. Our family wants to visit Shirdi but there are still a few hurdles. 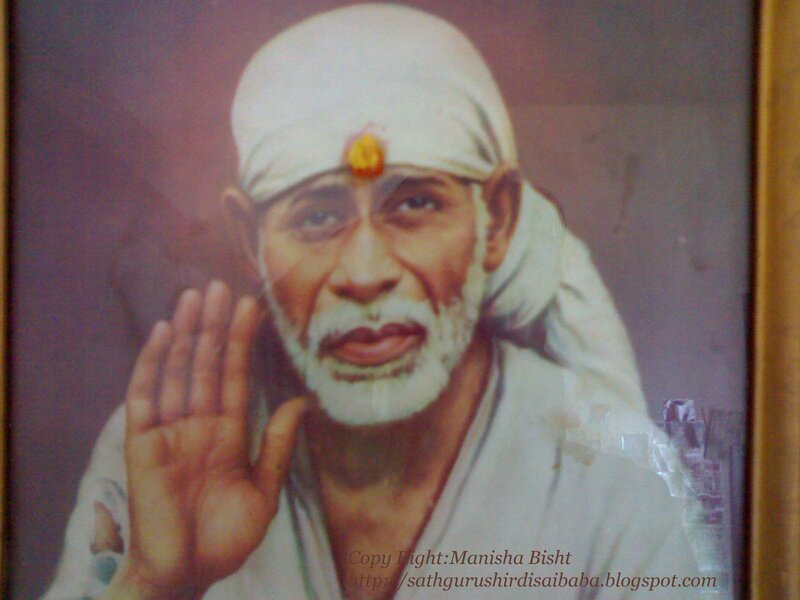 We all are praying to Sai to help us overcome them also and call us to Shirdi. May Sai Baba shower his kind blessing on me and my family always. Jai Sai Ram to all Sai brothers and sisters. May Sai shower his choicest blessings on all of you.